"I've always been fascinated by how many different breakfast foods you can create using just milk, eggs, and flour; and this is one of the more interesting examples. Especially considering the unusual, and borderline disturbing name. Sometimes called German pancakes, these have very little to do with Germany, and nothing to do with the Dutch. Apparently they were invented by German immigrants who were referred to as Dutch." Blend milk, flour, eggs, vanilla extract, and salt together in a blender until batter is smooth. Melt clarified butter in a 10-inch cast-iron skillet over high heat until bubbling; pour batter into the center of the skillet. Bake in the preheated oven until puffed and golden, 20 to 25 minutes. Brush with 1 tablespoon butter, drizzle lemon juice over the top, and dust with confectioners' sugar. 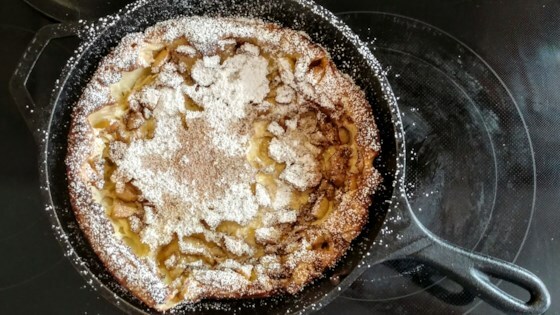 Try with sautéed apples and cinnamon cooked in the skillet before adding the batter and then serve it upside down--this makes a very custardy texture with the apples as topping. Mmmmm. Made this recipe last weekend exactly as written. Really easy and very delicious. I served it with southern sautéed apples.